Phuket Aesthetic Surgery Clinic gives the beauty on your face and body from our entire complete aesthetic surgery service with the very highly expertize and specialize in upper-lower eyelid surgery, breast augmentation, breast lift, breast reduction, otoplasty, brachioplsty, labiaplasty, etc. Besides cosmetic surgery and plastic surgery service, we have an experienced aesthetic surgery consultant and always give you the accurate answer and as much as information for your beauty. 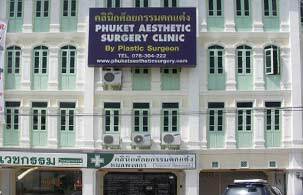 Phuket Aesthetic Surgery Clinic ideally located amidst the convenient transportation of Phuket town, easy to find parking space. Clinic stands opposite Tesco Lotus Phuket.